We caught a bus to Puno from Cusco with a company called San Luis. We paid S/25 (CAD$8.40) for 1st class seats. The ride was about 5 hours long. Puno isn’t a very attractive town and it doesn’t really hold very many tourist attractions aside from the fact that it sits on the largest lake in South America, Lake Titicaca. The lake sits at 3800 m above sea level which makes it the highest navigable body of water in the world. We stayed at the Walk on Inn (Jiron La Libertad 115) which cost us S/50 (CAD$16.70) for a private double with private bathroom per night. They served a delicious buffet breakfast for an extra S/8 (CAD$2.70). 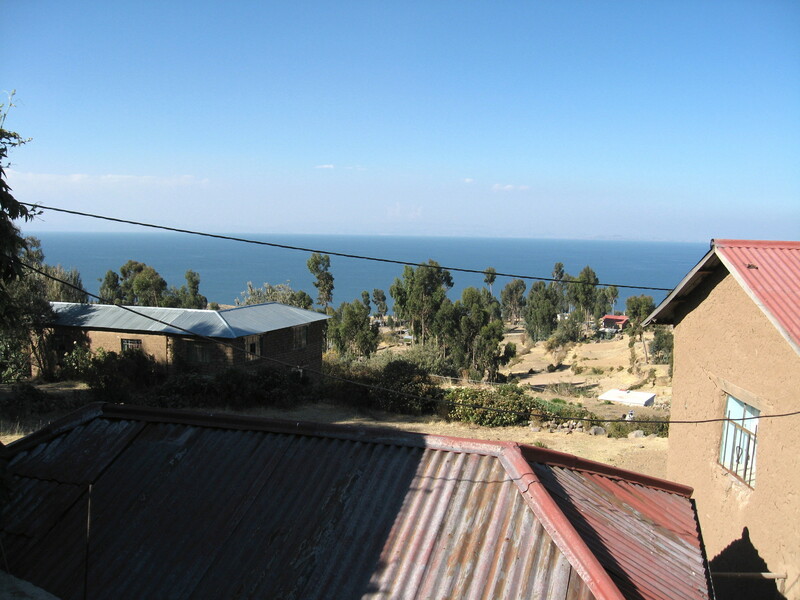 Through the Walk on Inn we booked a 2 day 1 night tour of Lake Titicaca for S/70 (CAD$23). It includes a stop on the Uros floating islands, Isla Tequile and an overnight stay with a local family on Amantani Island. We booked our trip through the hostel, but after discussing prices with other tourists on our bus we found it was possible to get the same tour for S/55 (CAD$19). Shop around at the different tour operators in Puno and be willing to haggle a little. Unfortunately, we didn’t spend much time in Puno and we didn’t take photos, but this blog has some nice pictures of the town and market. Otherwise, let’s go check out Lake Titicaca. 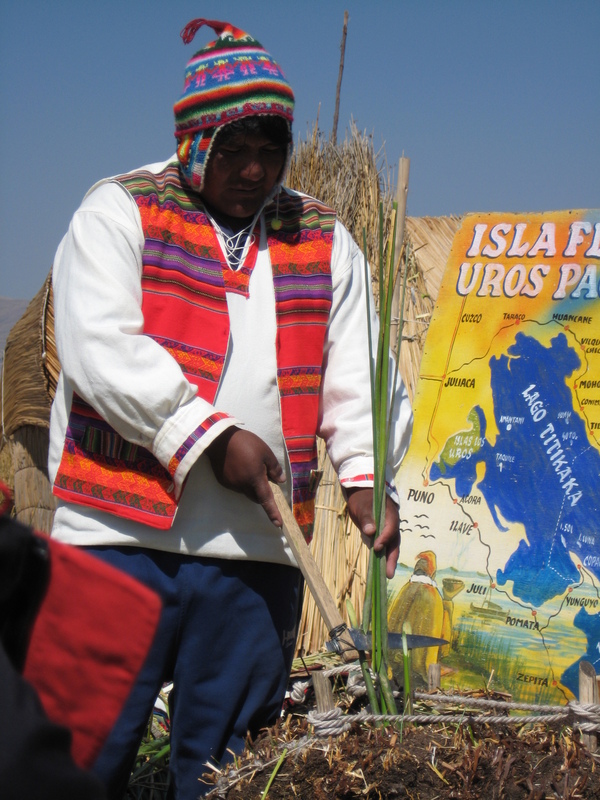 Our guide for our trip to Lake Titicaca, Rubin, was a native of the Uros Floating Islands. We first stopped at one of the floating islands where the president of the island showed us how the islands are made and maintained. The five families that live there let us see their houses, which are kitted out with solar-powered TVs (a gift from the government), and buy their hand-made products. Next up we had a 3-4 hour boat ride to Amantani Island where we met our host family. Barnaby picked us up at the dock. Luckily for us we stayed with the tour guide so he was able to translate for us. Mama (as she was called) cooked us a traditional lunch of quinoa soup, fried cheese, potatoes, and oca. After lunch we hiked up the largest peak on the island, Pachamama, to watch the sun set. We learned the benefit of mate de muna which helps with headaches and nausea caused by altitude sickness – it helped a lot. Rubin taught us how to rub it in our hands and smell the mint-like scent; even this helped to soothe my stomach. We made our way back down in the dimming light and Barnaby met us at the bottom with a better flashlight than we had and led us back home for dinner. Dinner was a soup made with semolina and a vegetarian stew with potatoes, onions, carrots. The food and conditions are very primitive. They have no electricity and use solar panels for radios and lights. They have no running water and must walk downhill to the well everyday for clean water. Barnaby and Mama run the local convenience store which sells candy, beer, cigarettes, etc. They are Adventists and do not drink or smoke. This means they ply their goods to the Catholics on the island. They also have a flock of sheep in the backyard (literally) and a collection of guinea pigs for “personal use“. 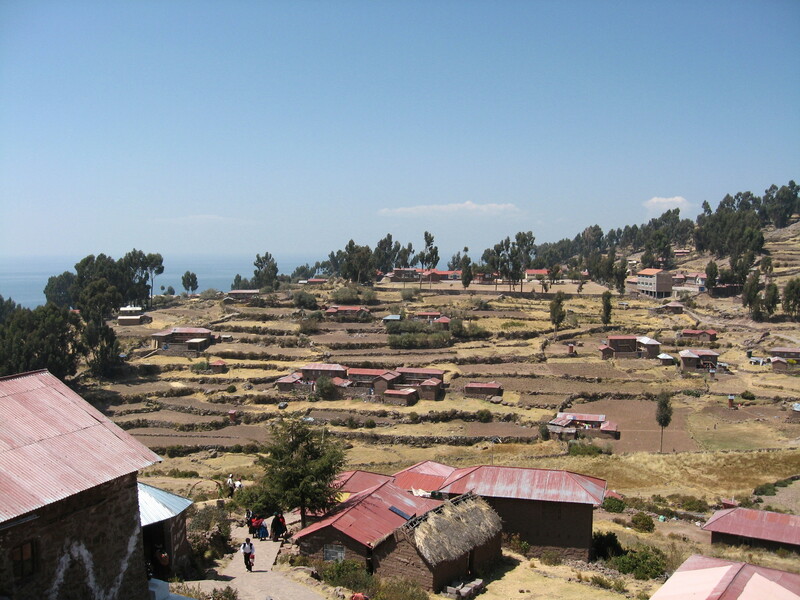 It was freezing on Amantani Island (and in Puno in general). We slept in our clothes and five layers of blankets and we were still chilly. The next morning we had pancakes for breakfast, said our goodbyes, posed in multiple group photos, and set off on the boat at 8am. 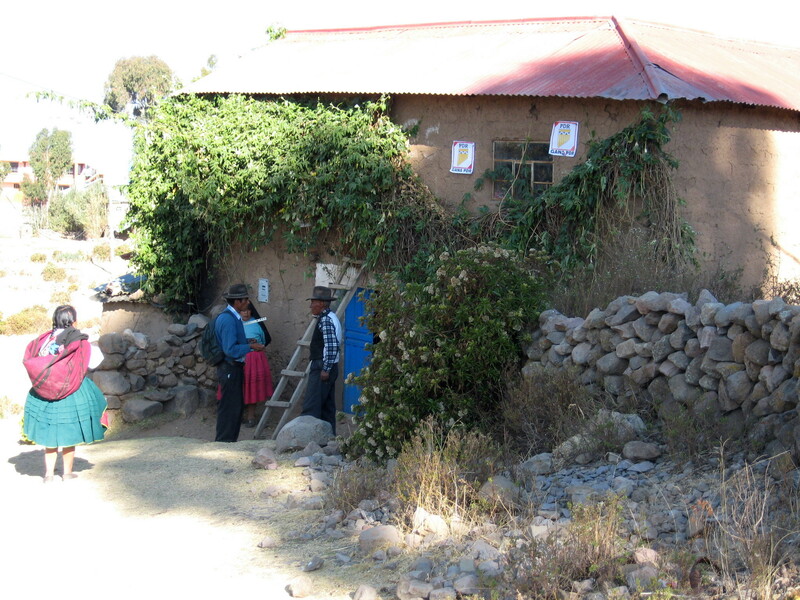 Next up was Tequile Island, about 3 hours from Amantani. We walked slowly uphill toward the main plaza where there is a two-floor market selling artisanal goods (although they are remarkably overpriced). There wasn’t much to do and a lot of free time. We stood on the roof and people watched until it was time for lunch at a family restaurant. The meal was not included in the tour price, but was definitely one of the most delicious we’d had in Peru. Fresh trout and quinoa soup with mate de muna. An hour boat ride later and we were back in Puno. Arequipa is our next stop. 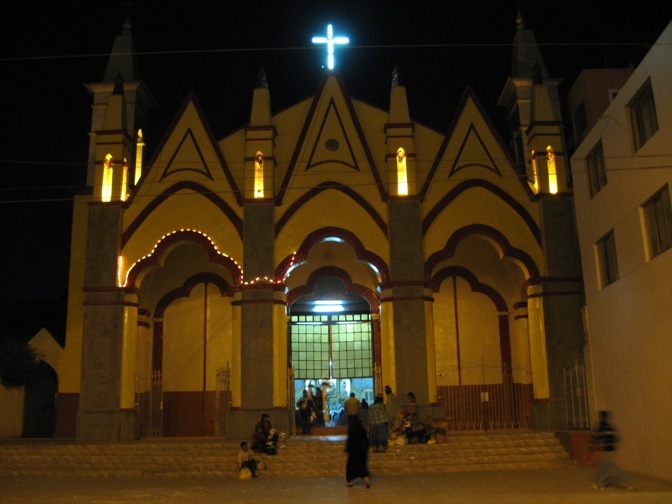 We booked our bus tickets with Cruz del Sur (S/54, CAD$18, 5 hours) as soon as we got back into town. 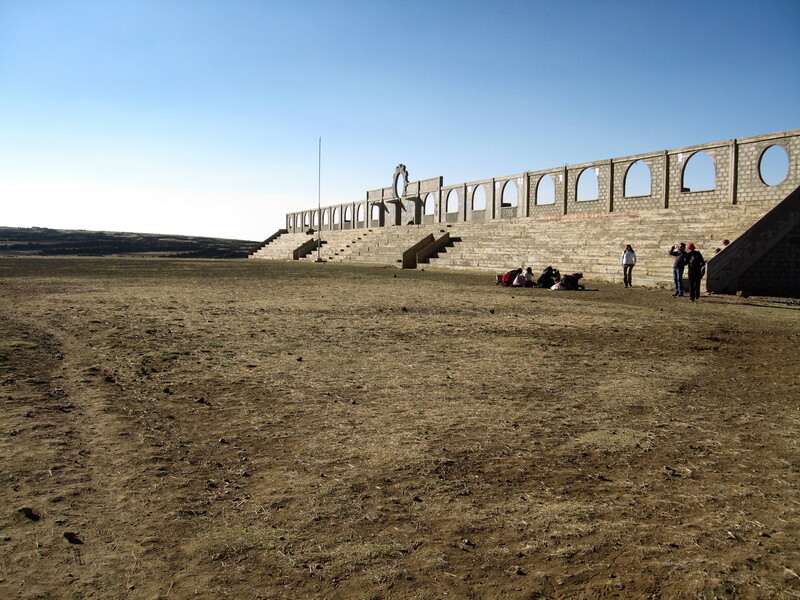 Three nights in Puno, including our tour of Lake Titicaca, cost us S/209 (CAD$70.50). This means we are now S/190 (CAD$64) over budget. Yikes!